First of I would like to thank Pikmin1211 for suggesting this mod, if it was for him i would have never started working on this mod. I would also like you to thank RoshiPlays even though I didn't use his textures he sent me he was a big help keep up your good work. Thank you bubbajunkgaming for making the topside texture of the AutumnLog. Finally thank you all how have enjoyed this mod for with out you I would have no purpose in making this mod. If you are interested in joining contact me at [email protected] and I'll ask you a few questions. Feal free to leave me any suggestions below. If you find any bugs please tell me. If you make a of the mod link this thread in the description and let me know if you make a showcase video so i can add it to thread. 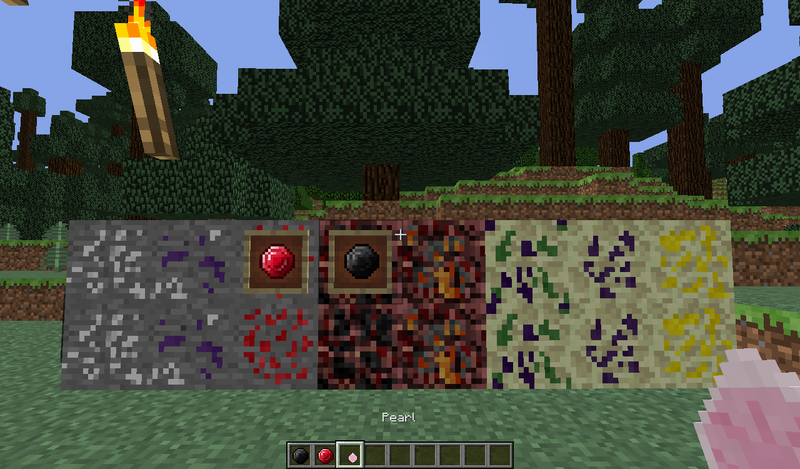 Okay, I will try making the textures and maybe ask TheDiamondMinecart to do this mod for us. I'll join! NICE MOD! It looks really good so far! Adding in that if you can make new GUIs for different blocks then it would be greatly appreciated! what do you mean a gui on different blocks? Similar to crafting, smelting, brewing, etc., but using new blocks and features. Working on ore generation for current for current dimensions also working on the ore which are going to generate in the world. I we'll also make some armour and weapons/tools. I try to get an update out Sometime next week. Does anyone have a suggestion for a better name? Okay, I'll try to use Photoshop or paint.NET for the textures. And also, thanks for your support Alpha! Okay, starting work on the NEW Ruby and Necromite, tools, and armour. Also, how do I link my textures here? Where is my Dropbox? Can you also tell me what textures you need? I'll test the mod, and I'll tell you what is good and what's not. Hopefully I'll be able to get the update out by friday still working on some bug fixes and I'm still testing the genaration for some of the ores. I'm also working on the necromite and ruby toolset/armourset. If anyone is interested in joining the devoloment of this mod send me an email or private message. I'm thinking of adding copper and titanium. Oh yeah I almost forgot, Roshi can you try getting me does textures done by to day. When your done send me a private message. Sorry if your feeling rushed but I'm try to get a released out tomorrow because I'm not available on the weekends. Roshi I have made the texture for ruby, necromite and silver armour for when it worn. All I need atm is the necromite and ruby toolset and each individual armour item texture. That is a wordy name and hard to remember. And guys send an email to [email protected] or private message me if interested in join My DEV for this mod. Zelda is now making a new update. I made some textures.